The NXG1 beadlocked wheels by OMF are designed to be the perfect addition to any UTV. Our Design & Engineering Team set out to create a blend of light weight and high strength in an American Made wheel, and the NXG1 wheel delivers! A spun aluminum barrel is utilized to keep unsprung weight down (11.9 lb. wheel, 2.4 lb. beadlock) while increasing durability. We all know damage to the wheel lip is a common occurrence, so the NXG1’s feature a heavy duty reinforcing ring on the back side of the wheel, and a beadlock on the front side of the wheel. Both of these components are machined from 6061-T6 precision aluminum plate for unsurpassed quality and impact resistance, and that same material is used for the wheel center to handle heavy side loads. The wheel features a black powder coated finish, a natural aluminum beadlock ring, and black hardware to round out the package. 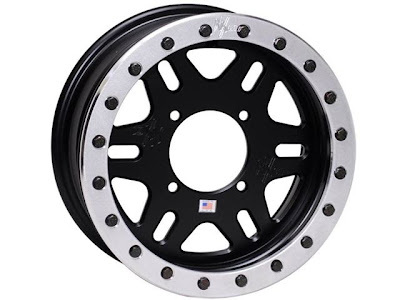 These wheels are being introduced in 14×6 and 14×7 sizes with bolt patterns to fit the all of the popular UTV’s. The 14×6 sizes features a 4” backspacing, and the 14×7 has a 5.375” backspacing to keep the overall width as close to stock as possible. Wrap this wheel with a 28×10-14 tire for a great all-around wheel and tire package. Find us on Facebook (www.facebook.com/nxgwheels) or visit our website at www.NXGwheels.com. OMF Performance Products, Inc. is a Riverside, California based manufacturing corporation that has been in business continuously since 1982, which specializes in hi-performance wheel modifications, such as beadlocks and reinforcing rings, for ATV’s, UTV’s, Trucks, Rock Crawlers, Sand Buggies, Off-Road Race Vehicles, Drag Cars, and custom applications.